If you are looking for Winnie & Walter - Day 1 release preview please click HERE. Hello Everyone, Welcome to the Essentials by Ellen Spring 2015 Release Blog Hop. For my today's projects I am showcasing the Amazing Women stamp set and Wild Garden dies. To begin my first project I cut a panel smaller than my A2 card kraft card base then stamped the panel with sentiments from Amazing Women stamp set to have the background sentiment for the card. I also used the Bohemian Garden stamps and its coordinating dies for added touch. PPP Sparkling Clear Exclusive from Ellen Hutson store. Here's the close-up of the sentiment background. Next, I stamped some flower and leaves from the Bohemian Garden stamp set on a watercolor paper and watercolored the images using Distress Marker from Ranger. Then die-cut using Bohemian Garden coordinating dies and adhered the die-cut pieces with dimensional foam tape on the card panel. To finish off the card I added some Sparkling Clear Sequins from Pretty Pink Posh. For my next project I used this gorgeous flowers and leaves dies from Wild Garden . This is really easy to do. I simply die-cut all the pieces then adhere them on a separate sticker sheet to avoid the die-cut pieces from separating (I only did this with some of the die-cut pieces) and colored each die-cut with Copic markers. I then fussy cut the die-cut piece and adhered it on my card panel. The sentiment I used was from the Mondo Magnolia stamp set. Here's the closer look. For the card panel I also added some splatter of ink using a wet watercolor brush. Winners will be announced May 8th. 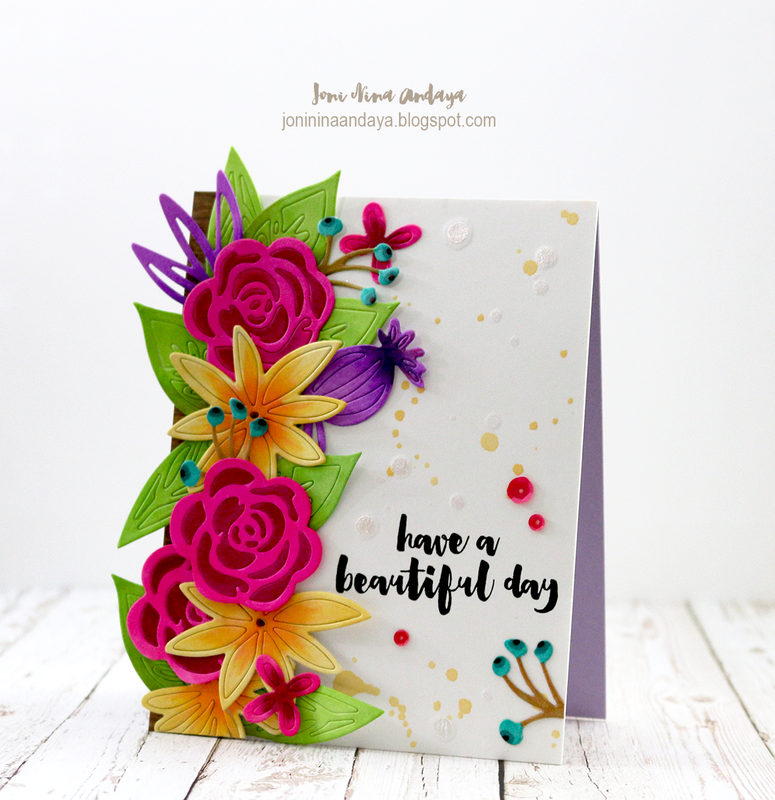 LOVE LOVE LOVE that bright colored, beautiful use of dies card! Wow.... two beautiful projects, both with amazing color! LOVE the Amazing Women sentiments/font! Oh, my! Your projects are fabulous! Clever designs and beautiful colors! I love that sentiment background, and all those colorful blooms are gorgeous. I always tell myself that I have enough flowers, but then I see Julie's latest and I can't resist. Nice and colorful. This is sure to make whoever receives this card happy. Great job. I just love the Wild Garden set! Great cards today! oh Joni, these are gorgeous! Love your use of color! Beautiful work! Wow Joni, these cards are fantastic. And my jaw dropped when I saw the second one. Those flower die cuts look amazing! I love the cards with the Bohemian garden set. Love the new collection! Great sentiment set! Love how your cards are two completely different color combos from soft & subtle to bold & beautiful. Thanks for sharing! Joni! You certainly do have a way with flowers!! Just so absolutely, positively fantastic!!! One soft and delicate, one bright and bold. BOTH beautiful!! These card are amazing and gorgeous. oh my goodness your first card is just beautiful. that's my favorite set of the release and you made me love it even more! Love them! The flowers look amazing! WOW!! Amazing...I especially Love the Bright One!! Both cards are so different yet each is beautiful! The colors of the flowers on that second card are fantastic! I really like both designs, you're so creative! LOVE BOTH CARDS...SO DIFFERENT, YET EQUALLY STUNNING. OMGosh I love both your cards! Couldn't pick a favorite as I love both the soft and bold look. Great use of these new products. I love the diversity of your cards....one so soft and feminine, and the other so bold and bright. Both are stunning. Your cards are beautiful. Just amazing! Love the stamped sentiment background. So pretty. Total gorgeous-ness! Your beautiful floral cards are so inspiring! GORGEOUS! Love all of those colorful die-cut flowers!! So bright and happy and beautiful! 2 great cards, but my fave is that second one!!!! Love the bright die cuts. These dies are lovely in these bright colors. Love the bold & bright card. I can see my bank account dwindling more & more as I continue this hop. Lovely cards. I like the softness of the first one and then the second is bright and cheery. Those strong colors are beautiful. The new word stamps are awesome as are your cards, especially the vibrant one. These are beautiful cards. Love the stamped background on the first card and the beautiful flowers on the second. Beautiful cards! I love this new release!! Wow! So soft and pretty, then so bold and beautiful! You really showed the range of potentials for this great release. Thanks so much! love both of your cards - hard to choose a favorite but it has to the first one for the lovely soft colors! with all those flowers is gorgeous! Beautiful work! I love you techniques! Both creations are gorgeous. I super sentiment background, and those bright spring flowers to brighten your day. Beautiful cards, lovely flowers. You make Julie's designs shine. Your projects are great. I love the background you created using the sentiments stamps! Thanks for sharing. Very pretty cards. The 2nd one is my favorite. Joni, your cards are amazing! Those sentiments are gorgeous. I could so use those with 4 sisters and my Mom, not to mention my sisters-in-law and friends! Who couldn't use those? Those bright and luscious flowers are so pretty! Wow that second card just blew me away! Love it!! Beautiful cards!!! I love how you used the sentiments to create a background!! I loved your pretty cards, so totally different! Thanks for the inspiration. Gorgeous! I really love the bright colors on your second card. Beautiful flowers! Love the sentiment background and the colors on the second card are amazing! Second card really got my attention. Gorgeous colours. The cards are gorgeous and elegant. I love how you did both of them and they are so different but have so much impact. luv the florals....especially that second card! Hi Joni. Your second card is absolutely amazing. I don't think I have ever seen anyone do that before. I saw it and a big Holy Moley came flying out of my mouth. Absolutely gorgeous - the colors in the first caught my eye over in the EH store (on the product page) but wow, the colors on the second card. Scrumptious. I love that die. That sentiment makes a perfect background for your flower bouquet and the colorful garden on the side of your card is a real show stopper. Absolutely wonderful card! The second is my favorite. Love your creations. Thanks for sharing your talent. You have an amazing eye for color - these are a real stand out! Wonderful card. So pretty and elegant! Your cards are always so fresh and amazingly beautiful. You did a wonderful job selling these stamps! Wow, I am blown away! Your cards are both gorgeous. I especially love bright colors on the second one. 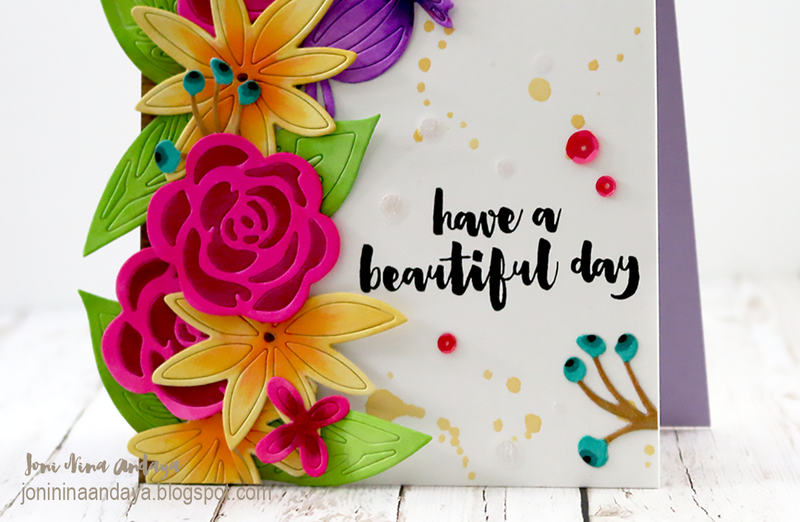 BEAUTIFUL cards, love the soft watercoloring and the sentiment background on the first one, and the bright, cheery die cuts and copic colored Wild Garden flowers on the second card, both just stunning! Soooooo pretty!! Your second card is so vibrant and eye popping! I love the watercoloring on your first card. Oh my goodness! You have created to simply amazing cards! Good thing I don't have to pick a favorite. It would be impossible to choose! LOVE the bright, colorful card! They are all so great. My fav is wild garden though that one POPS! I love the Die Cut flowers. Beautiful technique. Nice contrast...soft and sweet and bold and bright. Love them both! Both of these cards are amazing, but the bold colors on the second one absolutely knock me out! All I'm thinking is OH MY GOODNESS!!! Your 2nd card is A-MAZ-ING with all the bright colors for the flowers!!!! Gorgeous cards Joni. Love the water coloring on the first one and the rich colors on the second. Those flower images and dies are amazing. Gorgeous cards! I love the bright colors on the 2nd one and the pastels on the first! Your first card is gorgeous with the soft watercolors. I love how you used the sentiment to create the background. Love the bold colors of the second card. Thanks for the great inspiration! purply card! So rich and gorgeous! Love you style, love how you can make so bright yet so stylish cards! Beautiful cards! Love the stamp sets as well! I love that you made your own background on the first card - and the colors on the 2nd .... WOW. LOVE IT! Gorgeous, gorgeous flowers! I love the colors, especially in the second card. It is just beautiful! Both cards are stunningly beautiful - but I especially love the vibrant colours of the 2nd one - it makes me smile instantly! Love all the bight colors!!! Beautiful cards. Love the soft colors on the first card. I love your cards and the colors you used. They are beautiful and inspiring. Love,love,love the background stamped and the next card...Wow! what color. Very Happy card. Thanks. 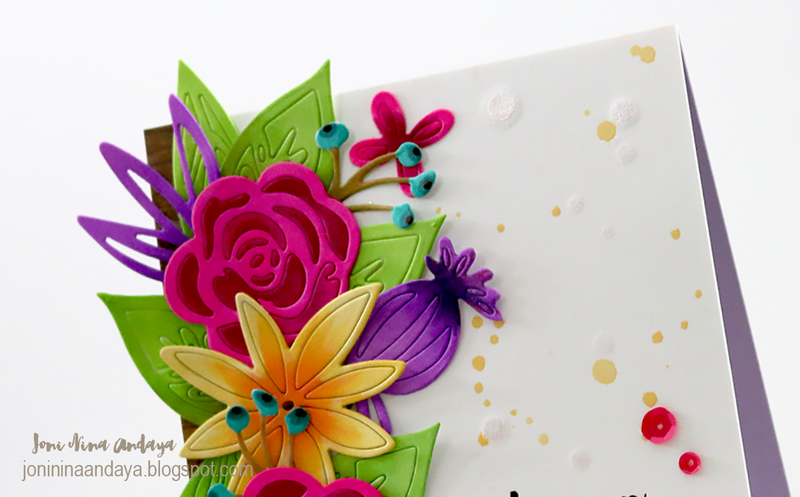 lovely bohemian florals especially that bright colorful die cut card! Wow! Two very different cards :) Both lovely. Love what you did there with the die cuts on card #2! Neat! WOW, these are both stunning!! I'm loving these flower sets. Very pretty! I am in love with your second card - these colours are so vibrant and fabulous! Beautiful cards! I like the soft colors of the first card but I really love the bold, brightness of the second card. Thanks for sharing! I like the soft background words on the first card, and the wild tropical flowers on the second! Absolutely fabulous cards and clever techniques....thanks for the inspiration! Gorgeous cards, Joni! I love this new release!! Wow, talk about making a card pop with color!!! Beautiful card creations! The sentiment stamp is a favorite because it is wonderful for all the special women in our lives! wow, wow, WOW!! your card are STUNNING! I love the use of the background sentiment. Gorgeous! Oh, my! How beautiful. The second card (colored with Copics) is striking. Wow, night and day these cards are! Start softly and then go out with a colorful explosion! Fantastic! I thought the first card with soft sentiment background was breathtaking and then the cheerful bright colorful Wild Garden card appeared. Thank you for sharing! Stunning! oh my word!!! those blooms are amazing!!! oh, seriously, beautiful job!!! Lovely cards and die. Thanks for the chance to win. That bright card you made is beautiful! Thanks and thanks for the giveaway! WOW! I love how stunning and vibrant your second card is. I really like how you die cut it and then replaced the negative pieces, sometimes matching and sometimes not. I will have to give this a try for sure. Thanks for sharing your creativity with us, and of course for the chance to win this great stamp set!!!!! Love your cards and the sayings. Just beautiful! This is a lovely release. I love the pastel one. My eyes bugged out when seeing the bright one especially because of the contrast but it is pretty too. Reminds me of the rainforest. I love that you used the sentiments as a background on the first card. Just beautiful! These cards are gorgeous! I always forget sentiments can be stamped in any color, not just black.. haha Thanks for the reminder! So pleased that I ordered this Bohemian set. You've really showcased it spectarcularly. 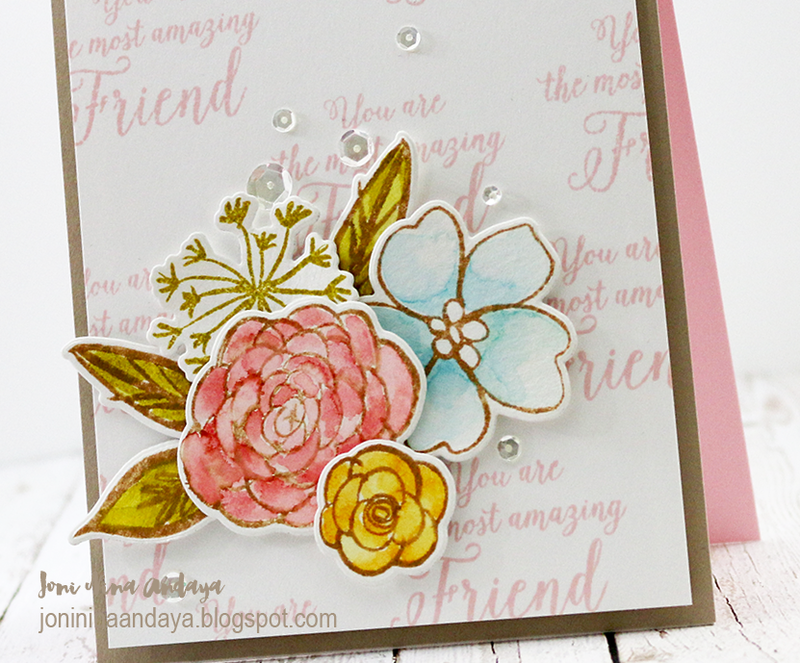 I love the soft watercolored flowers, AND the bold die cut flowers! Beautiful. Your cards are so beautiful and I love the watercolored flowers on the first one. Absolutely GORGEOUS! LOVING those flowers!!!!!!!!!!! Gorgeous!! So much so I'm now following your blog!!! WOW!! These are both stunning cards!! That second card is simply stunning in it's beauty! What spectacular cards! The saturated colors on your second card is amazing! Very pretty floral cards. I like the colors and the use of sequins. Love your bold colors! Thanks for sharing. Joni, your card is a piece of art! This is simply stunning! The coloring on the second card is amazing ... wow. Love your cards (especially the colors in the second one) and that bohemian flower set. Wow! Both of your cards are gorgeous! What a fun release! Oh my goodness, both of your cards are so stunning! Thanks for sharing, this is a terrific release! Beautiful cards and in such different styles! Wow, I LOVE the flowers, especially the bright ones on the second card--beautiful! Just beautiful, I love them both. I love the coloring in the first card, it's so feminine, which is perfect with the new sentiment. What a beautiful release. Thanks for sharing and the chance to win. Wow! That second card just jumps off the screen. Gorgeous! Your cards are fantastic. I love the inlaid die cuts. Inspiring cards! Thank you for sharing! WOW! The colors are so vibrant. Just love them. Beautiful cards...the second one is drop dead gorgeous! Totally blew me away. Gorgeous cards. I love how the first one is so classy, but the second one is eye-popping WOW! Awesome cards! With this new release we can all make awesome cards. Your samples are very pretty and inspiring to me! I love them both; thanks for sharing your techniques! Your cards are sooooo pretty. Thanks for sharing. Love your amazing creations. Especially the second card! Beautiful. Wow! The cards are so different! I love the colors! Wow, Joni! These are both beautiful!!! Breathtaking!! Absolutely, incredibly, truly amazing!! WOW!!!!!! Lovely creations. I love your color choices. Absolutely gorgeous cards!!! These stamps and dies are amazing! Just an awesome release! Wow! What a wonderful talent you have! Ellen Hutson has the best customer service!! The have a beautiful day card is absolutely gorgeous! Love the technique used. These are beautiful Joni! Love them. beautiful and awesome cards, in the first card I love the background, in the second the amazing color you use! GORGEOUS cards, love all the flowers! Both cards are beautiful but the 2nd card is stunning with those rich vibrant colors!